The following is an opinion article from Kevin Van Leer, a senior product manager and US wildfires expert at catastrophe risk modelling and data analytics company RMS. The views expressed within the article are not necessarily those of Insurance Business. For years, the risk to insurers from wildfires has been steadily increasing, as urban communities spread outwards towards vegetation-laden areas. We’ve suspected that climate change is playing its part too, likely producing longer and hotter burn seasons. But in the last few months the alarm bells have been ringing loudly and clearly, as a set of particular climatic conditions have made California optimal for wildfire catastrophes. The images have been dramatic and distressing: homes and livelihoods going up in smoke, and insured losses spiralling. The time for the industry to act has come. The climatic conditions we’ve seen in the last few months are typical for the region and for this time of year – hot temperatures and dry winds – but what’s different now is the strength and duration of these winds, and the lack of rainfall. Take the Santa Ana winds in Southern California. The last time they persisted at this strength over three days was in 2007 and that resulted in the Witch Creek fire that destroyed over 1,200 structures across San Diego county. Special climate conditions like this Santa Ana wind event, and the Diablo wind event that contributed to the Wine Country fires in early October, are significant drivers of increased wildfire risk over a short period of time. The combination of these two episodes and additional fires across the country have resulted in one of the worst wildfire seasons in US history with respect to acres burned, structures destroyed, and total insured loss. 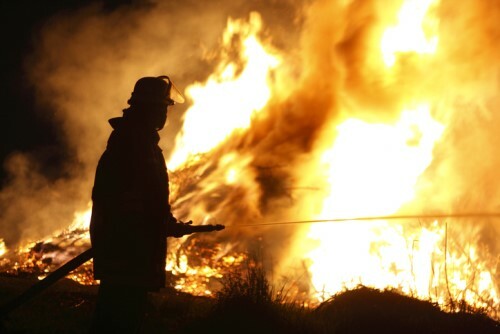 When a fire ignites during a high wind event, they typically spread rapidly, stretching firefighting capabilities for suppression and containment until conditions subside. In the case of the Thomas fire that has impacted Ventura and Santa Barbara counties through early December, the flames spread across roughly 1,000 acres within one hour of ignition on the night of Monday, December 04, and to over 50,000 acres and at least 150 burned structures after 24 hours. Now that fire is approaching the top of the list of largest wildfires in California history in terms of acres burned, in addition to other fires that have burned areas of Los Angeles and San Diego counties. There does seem to be a distinction between the fires which have affected the north and south of California. In comparison to the roughly 8,000 structures destroyed during the Wine Country fires in October, with US$9.4 billion in insured loss according the California Department of Insurance, the reported number of properties affected from the fires in the south of the state appears to be significantly lower, despite more acreage burned. The total count of structures destroyed or damaged so far for Southern California is around 1,400 buildings [by mid-December]. But the risk can be modelled and managed. Next year will see the introduction of new tools to quantify wildfire risk, including a probabilistic model. Critical insights included in the model from recent events, like the California fires, and the latest building material and mitigation research will enable the industry to better manage and price this peril. For example, the characteristics and likely recurrence of the special conditions seen in the last few months must be considered within the creation of an event set. These extreme high wind/low moisture conditions have the capacity to result in tail events that include higher rates of spread and intensity while also taxing firefighters and suppression resources. The implications of these conditions are critical to understanding how to capture realistic wildfire behavior in the fire spread module of catastrophe risk model. The impacts of floating ember accumulations should also be accounted for, as these have been responsible for much of the catastrophic spread. With the availability of new tools for quantifying wildfire risk, wildfire-specific insurance products, such as smoke sub-limits, new peril guidelines may begin to take shape. The flexibility to understand the impact and sensitivity of such practices will guide the insurance industry to a more advanced understanding of not only wildfire hazard, but also mitigation measures and potential losses. The old mantra may be that risk is opportunity. But that holds true only if you fully understand the risk. Because that’s not yet possible, the insurance industry is hamstrung, unable to properly manage aggregations and potential tail loss events to reduce the possibility of surprises. With new modelling available next year, however, insurers will have the insights to make more informed decisions during risk selection. The context will be available to not only look at the risk to an individual location, but also an entire portfolio of exposure spread areas that may not have previously been considered at risk using traditional hazard tools. The preceding was an opinion article from Kevin Van Leer, a senior product manager and US wildfires expert at catastrophe risk modelling and data analytics company RMS. The views expressed within the article are not necessarily those of Insurance Business.